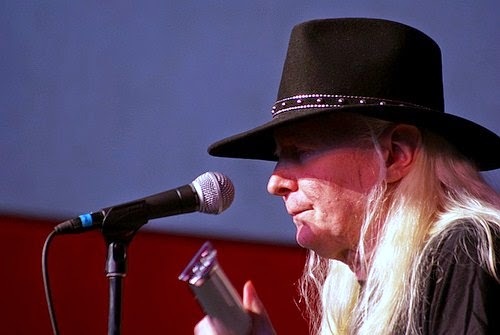 O.K., yesterday, I read in THE CHICAGO TRIBUNE that BLUZZZ Guitatist and singer JOHNNY WINTER and HERE is dead. He was 70 years old, touring in Zurich and died in his hotel room, just two days after performing a show. Cause of his unexpected death was not stated and unclear.. He was known for his raspy singing voice and blues guitar work. Some say he was one of the very best blue's guitarist ever, being ranked number 63 in THE ROLLING STONE''s... 'The 100 Greatest Guitarists Of All Time '. Winter was also put into the BLUES FOUNDATION HALL OF FAME in 2003 and produced three GRAMMY AWARD winning blues albums with MUDDY WATERS in '77, '78 and 1979..
At the early age of ten, Johnny appeared on a children's show, with his brother EDGAR WINTER singing 'EVERLY BROTHER's tunes, Johnny played the ukulele. He began playing the guitar 'round 15 years old.